Xavi (born 25 January 1980) is a Spanish football player. He plays for Al-Sadd. On Euro 2008 Xavi won the UEFA player of the tournament, a prize that the best player of the Euro Tournament gains. 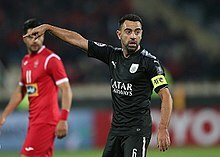 Xavi in Persepolis and Al Sadd Match. Barcelona B 1997–98 39 3 – – – 39 3 ? Barcelona 1998–99 17 1 3 1 6 0 1 1 27 3 ? ↑ Strack-Zimmermann, Benjamin. "Xavi Hernández". www.national-football-teams.com.